Roger Dixon, the painter, was born outside London in 1943. His father was a collector of all kinds of art and antiques, his mother was a painter. In a riotously untidy house he saw a multitude of forms and colours, and outside he revelled in the beauty of Nature. In the workshop he started painting, already using oils. But he was miserable at school, academically mediocre, and increasingly rebellious. At seventeen he could stand it no longer. Oppressed by boredom and conformity, impelled by an urgent sense the real life awaited him, Roger fled to Paris. There followed a three year adventure, mostly penniless, sometimes accompanied by his first girlfriend, that took him through all the countries of Southern Europe from Lebanon to Portugal. Mass tourism was unknown, the roads were empty, and the local people were hospitable. For him it was the most formative period of his life, vividly remembered. He fell in love with the Mediterranean, its beauty and climate and friendly atmosphere, and that turned out to be a decisive influence in his life. He did return to London, thinking he might have made a mistake. He tried to integrate into society, got a job in television and then found a studio to develop artistic ideas – at that time Op Art sculptures made with glass and mirrors. But the sun and freedom of an outdoor life drew him back to France, and then to Spain. In 1968 Roger came to Ibiza for the first time. The island was largely undiscovered, life was inexpensive, and it felt idyllic. After a trip overland, mostly hitch-hiking, to India and Nepal, he realised that Ibiza felt like home. And the journey to the East laid the foundations for his other main interest in life alongside painting – the so-called spiritual search. So there seemed to be only one way for this wayward romantic: to paint and to use painting the beauty of the countryside as a kind of meditation. And without compromise: no second jobs, no business diversions. He took time to study life drawing for a year at the Beaux Arts in Paris. Back in Ibiza he started to sell his first paintings. It was the start of a long saga of improvisation in daily living – one way or another the island always supported him with a place to sleep and enough to eat. 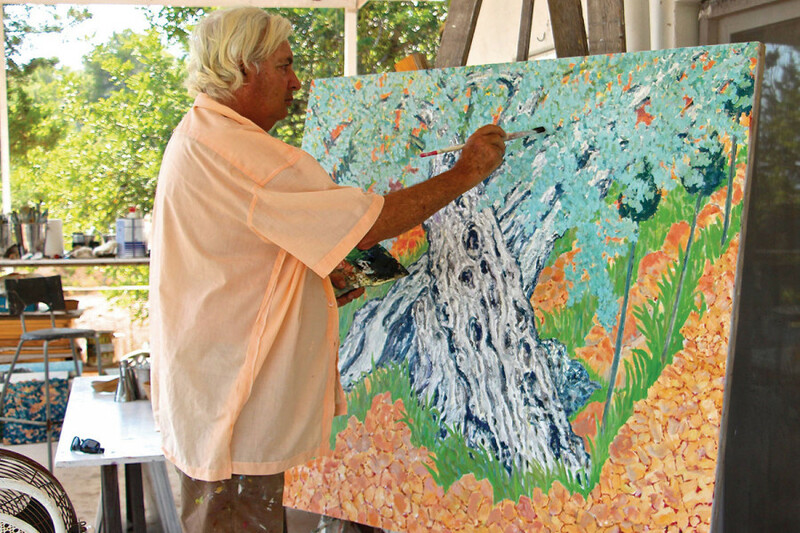 Nearly forty years on, he is still here painting the landscapes and details of the island. He usually works outside, always with oils and linen canvas. About his work he says: “The art I am interested in is not conceptual or idea based or illustrative. It must come from a source beyond the intellect, call it inspiration or intuition. I find that when my personality interferes, which often happens, the work becomes lifeless.” In the winter he often travels to Asia – of recent years mostly to Cambodia, where he started an NGO for children from very poor families. For the rest he leads a pretty simple life, returning to Northern Europe only rarely.